Sole F85 or TT8: Which is the best model? One thing is for sure: They’re both powerful treadmills. This comes as no surprise given the fact that they’re both manufactured by Sole Fitness. But what’s so special about Sole Fitness? It’s the industry’s leading manufacturer in award-winning fitness equipment. Here we’re talking about everything from ellipticals to treadmills - our focus today being on the latter. Their products aren’t only of exceptional quality but are affordable too. No wonder they’re a common sight in most fitness centers. Even hotels believe in these products as shown by how most use the equipment in their various Room Fitness programs. And now we’ll discuss a few specs to aid in the comparison so you can pick your favorite. Sole F85 vs TT8: Which is Better? At a casual glance, both treadmills appear to be the same. While similarities are there, there are certain features that’ll differentiate the two where factors such as performance, durability, and versatility are concerned. The value and performance of a treadmill partly lies in its motor. Put simply: A motor will determine a number of factors including maintenance and the power at which it runs at. This, in turn, determines whether you use it for home or commercial use. See why it’s important? The TT8 machine has a dual motor meaning there’s one in front and another at the rear. This means it has slightly more horsepower than the F85 which has a single motor. Most treadmills have inclines - which work by increasing speeds upwards - and few have decline levels. Treadmills with decline grades will simulate running downhill and especially work if you’re just starting on a fitness program. It’s also a good zone for warming up especially for the serious walkers. The TT8 becomes the more appealing option if you’re looking for the above-mentioned end results. 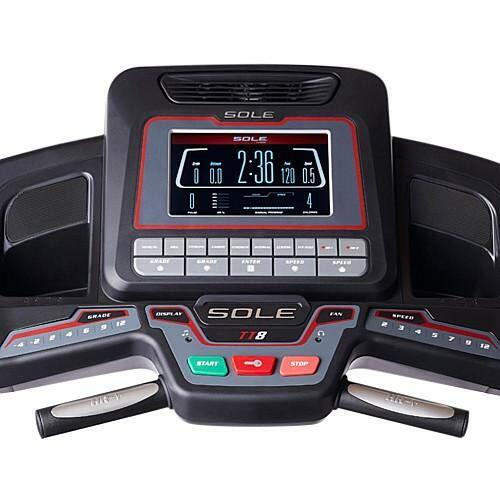 Not only does it have a power incline, but Sole Fitness also added six decline levels on this model: 0-6. On the other hand, this feature is absent in the Sole F85 which only features a power incline. Want a durable treadmill? Check the type of belt - particularly the thickness. These belts can either be single, two-ply or four-ply with the latter being the thickest. Needless to say, the one with the thicker belt is the one you want if you expect a long lasting machine. In this case, the TT8 has four-ply belts while its counterpart only has two. Based on the above information it means between the two, the TT8 is a more durable option. Not everyone has a home gym to leave equipment in its operating state. If you’re the type that prefers to free up some floor space then a foldable machine is ideal. That way you can pack it up after each session. This is where the TT8 seems to fall short as it is isn’t foldable. The F85 is a more portable option in this regard and makes for better storage. To have your body look a certain way you have to be willing to pay the price - literally. 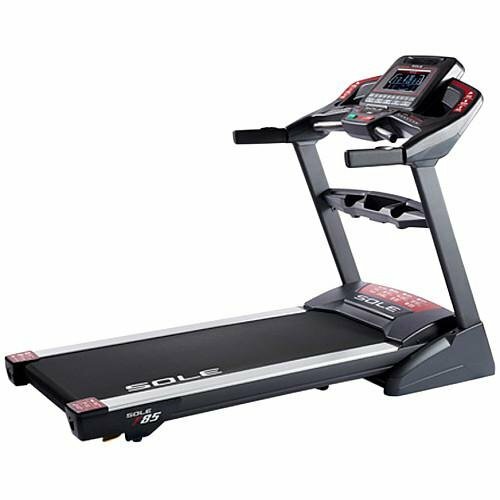 These treadmills are available in varying price ranges so you can find one to suit your budget. But bear in mind the cheapest may not always be the best option. A lot of factors may be compromised from performance to warranty. Rather consider the individual specs first before simply shopping based on price. Between the two models, the Sole F85 is significantly cheaper than the TT8. This is probably a machine for those who want a lot of running space on their treadmills. 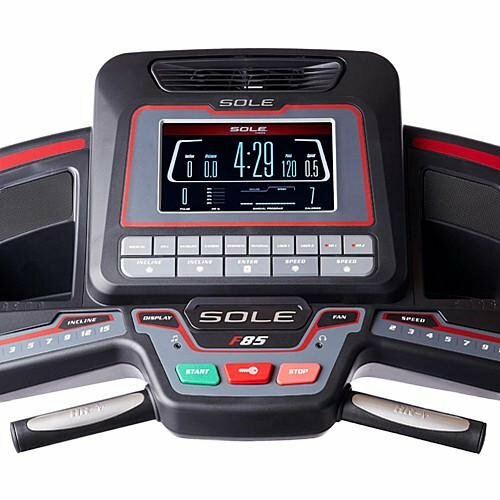 It has the largest deck ever manufactured by SOLE: A 22” wide running surface. 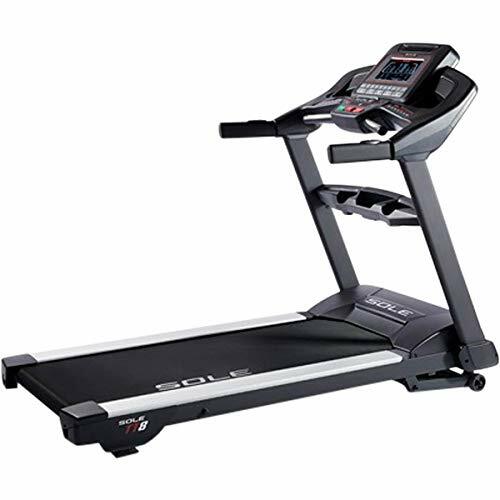 It can even handle persons weighing up to 400lb: A feature which is rare on most treadmills. One of its unique features is the Cushion Flex Whisper Deck which is known for reducing the impact on your joints as you exercise. It offers 4.0hp and a DC type motor which can reach speeds of up to 12mph (These happen in increments of 0.5mph). It comes with a pulse grip and chest strap so you monitor both your pulse and heart rate during use. That way you’ll know when you’re overexerting yourself. It has six standard programs and two custom programs as well as two heart programs making it a comprehensive unit. The LED display panel isn’t only user-friendly but large meaning you can clearly read the characters. You’ll, however, be disappointed that you won’t be able to distract your mind by viewing scenery during use. This is because it doesn’t come with a video monitor. This is the preferred model among most fitness fanatics owing to its exceptional performance and solid construction. It actually competes with most commercial treadmills where functionality is concerned. The only difference is it’s considerably cheaper. The running surface is even wider than the F85 - measuring 22” wide. It can accommodate persons who weigh up to 425lb. The running belt is the widest in the Sole catalogue making it comfortable for any runner regardless of speed. The TT8 treadmill is also a very durable unit thanks to the powder-coated, all steel welded frames and the heavy duty inclines. How does it fare performance wise? Similar to the F85 it also offers 4.0hp which runs up to 12mph. The only difference is it’s upgraded to offer slightly more horsepower. As mentioned earlier, the TT8 has both incline & decline levels: 15 and 6 respectively. With this machine, you can expect a quiet workout session thanks to its vibration-free surface. Our only major complaint is it takes time to change between speeds. Also, it takes about an hour to assemble. The reviews are in so what’s your verdict? Aside from the differences listed above, they do have similarities such as the 10” screens as well as the Cushion mechanism designed to reduce impact. So which one will you pick? A healthier lifestyle is a treadmill away.